I've always been surrounded by people who love horses though and love to read about them. I don't happen to go in much for animal stories as a general rule, although I have received e-mails from people asking me to highlight horse literature. (Yes, occasionally people do e-mail me asking me to read specific things.) Whenever I choose to pick up something out of my league (like horse literature) it's generally because I think someone I know might like the book for themselves and I'm curious to give the book a look-see for the sake of a good friend. 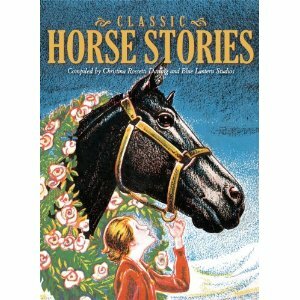 Such was the case with Classic Horse Stories , compiled by Christina Rossetti Darling and Blue Lantern Studio. This book is filled with vintage artwork, which I confess is what drew me to it in the first place. This is definitely the case where the cover art snookered me into the read! The inside of the book is filled with excerpts of well-known stories such as Black Beauty, The Black Stallion, and even The Horse and His Boy. There are also poems, of course, (by people like William Shakespeare) and short stories. The artwork which accompanies each piece is truly lovely in every way. There are sketches, 1950's prints, paintings, etc. There is a nice broad variety of horse loving things included in this one book. I believe the target audience for Classic Horse Stories are girls. It definitely has a bit of a "pro-girl" flair for me which I think is mildly regretful (because there are plenty of boys who like horses too. At least, I suspect that to be the case.) Although there is a girl focus, it's still a nifty little collection. If you really like horses. Which, since I know people who do, I gifted the book to them to enjoy as they see fit. If you like horses, and you like vintage art, then I'd definitely say that you might want to check this new book which was just recently published by Chronicle Books. I appreciate their sending me a copy to peruse! Thanks so much for the review! This is now on my daughters Christmas list! She Has been riding since she was 2 and LOVES horses! This sounds like one my resident horse-lover would love. You're right -- so many of these collections are targeted at girls. (Not a problem in this household!) I can think of some picture books about horses that seem aimed at boys, but they're older series, like Billy and Blaze. What an amazing book! Fun fun fun! I love the old timey drawings and illustrations too! Horses... um... yeah, I don't get the appeal. I'm just not much of an animal girl.